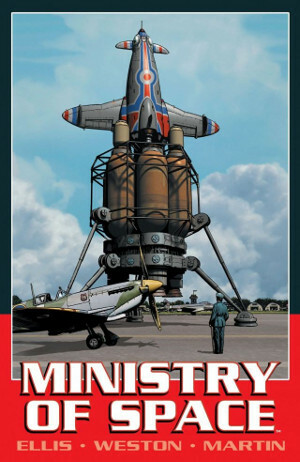 Exciting news – Warren Ellis and Chris Weston‘s 100-page graphic novel Ministry of Space can now be had in electronic form. Ministry of Space tells the story of how we could have gone to space. Maybe how we should have gone to space. This is the story of the Ministry of Space. The black budget that financed the move into space. The deaths of the test pilots taken from the surviving Spitfire flyers of the Battle of Britain. And in 2000, the end of the Golden Age, as America and Russia begin moving into space. The secret revealed, and the destruction of a man who sacrificed himself for the Ministry of Space. This edition includes a sketchbook section by Chris Weston and an all-new appendix by Warren Ellis. If you’d prefer to get your hands on a physical copy, why not pick one up at Amazon. This entry was posted in announcement and tagged space, Warren Ellis. Bookmark the permalink.